Coming off of his record-breaking 1974 season when he stole 118 bases, the 36 year old then went on to steal another 56 in 1975, pushing him past the 800 mark for his career. 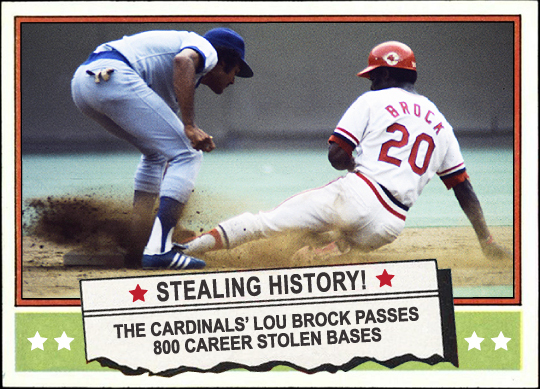 Of course, he would go on to steal another 138 bases before he was done, not only passing Ty Cobb for the “modern” MLB record, but even the great Hall of Famer Billy Hamilton from the 19th Century, who stole 914, unquestionably giving Brock the record until a guy named “Rickey” came along. I love the extra logo sticker the St. Louis Cardinals used on their batting helmets in the middle of the 1970’s, shown on the image here. 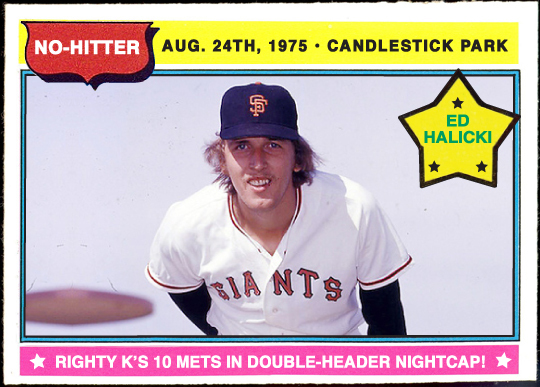 The 24-year-old was in his first full season when he turned in the performance of his career, striking out 10 while walking two, on his way to the no-hitter at home in Candlestick Park. Gary Thomasson and Willie Montanez drove in two runs each, supplying more than enough offense to give Halicki the support for the win, improving his record to 8-10 and lowering his ERA to 3.48. Turns out Giants fans would have to wait another 35 years before another of their pitchers threw a no-hitter, when Jonathan Sanchez did just that on July 10th of 2010. Nevertheless, Halicki, though he did put in a nice seven-year Major League career, reached the pinnacle of his Big League days that day in 1975. 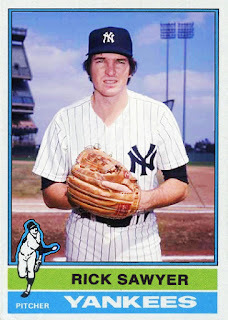 Sawyer originally came up to the Big Leagues with the Yanks, first appearing in a single game during the 1974 season when he pitched 1.2 innings. 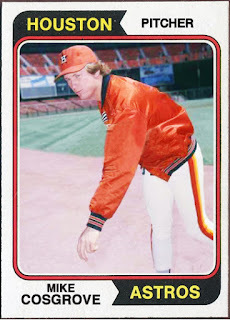 In 1976 he was back, albeit for only four appearances out of the bullpen, not factoring in a decisions and posting an ERA of an even 3.00 over six innings of work. By the time the 1976 season opened, he found himself a member of the Padres, posting a nice year with a 5-3 record over 13 appearances, with an ERA of 2.53 over 81.2 innings pitched. In 1977, he would appear in a career-high 56 games, with nine of them starts, throwing 111 innings and going 7-6, though with a bloated ERA of 5.84. Sadly, that would be the end of his Big League days, as he’d spend all of 1978 in the Cleveland Indians organization, posting an ugly 6.43 ERA over 28 innings, ending his pro career. Cosgrove had a very nice showing over those 13 games, posting an earned run average of 1.80 over 10 innings while going 1-1, all out of the bullpen. His first taste of the Big Leagues was a season earlier when he came up for seven games, going 0-1 with an ERA of 4.61 over 13.2 innings, with a start thrown in. He would go on to play five years in the Majors, all with Houston, finishing up with a record of 12-11 with an ERA of 4.03 over 119 appearances and 274.2 innings pitched, striking out 122 batters while walking 145, collecting eight saves between 1972 and 1976. 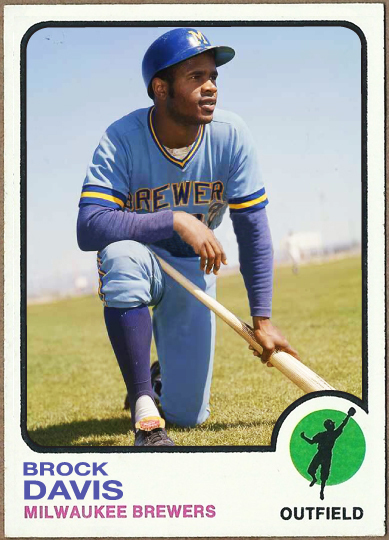 Davis had a very nice 1972 season for Milwaukee, hitting .318 with 49 hits in 154 at-bats, scoring 17 runs and driving in 12 himself. Easily the best season of his sporadic run in the Majors, turns out they’d also be the last, as he’d spend the next three years in the Minor Leagues playing for four organizations before retiring for good after the 1975 campaign. Originally up for his first taste of the Big Leagues in 1963 with the Houston Colt .45’s as a 19-year old, he went on to play parts of six seasons over 10 years, hitting .260 with 141 hits in 543 at-bats playing for Houston, Chicago Cubs and Milwaukee between 1963 and 1972. 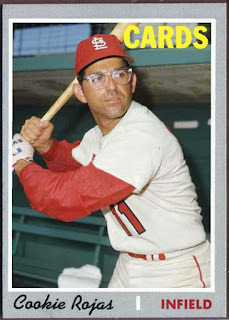 Oliver hit .222 over those games, collecting the final six hits of his career in 27 at-bats in what turned out to be the end of a Big League run that began back in 1959 when he came up with the St. Louis Cardinals as a 24-year-old. 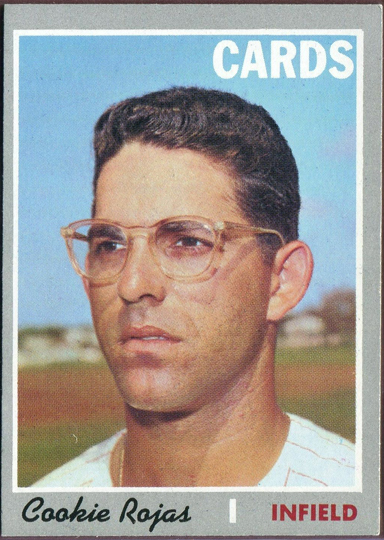 His best year was 1965 when with the Milwaukee Braves when he appeared in 122 games, hitting .270 with 21 homers and 58 runs batted in in 392 at-bats. By the time he retired, he finished with a career .246 batting average, with 93 homers and 320 RBIs, collecting 546 hits in 2216 at-bats over 786 games. Topps originally used their tried and true method at the time of the cap-less portrait shot of Rojas, devoid of any team identity. 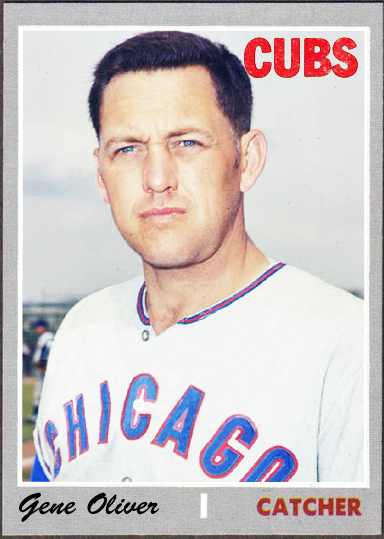 Funny enough, he would be traded not too long into the 1970 season to the Kansas City Royals where he’d run out his nice 16-year career, playing the final eight seasons in K.C. and becoming a fan favorite before retiring after the 1977 season at the age of 38. The five-time All-Star retired with a .263 career average, collecting 1660 hits over 6309 at-bats, scoring 713 runs and driving in 593.